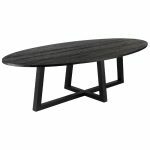 The Ovalis dining table is designed with an oval top and a gorgeously crafted cross base. Perfect for large dinner parties or even as a chic conference table this piece will see you through many years of happy entertaining. Natural elm finish is smooth, Black finish has deep grain.